Williams Engineering Canada (WEC) provided the mechanical and electrical design team for various Browns Socialhouse franchises throughout Western Canada. The Socialhouse’s are a cross between upscale and casual dining with a pub-style social flare and are strategically placed in upcoming communities that have a smaller footprint, thus providing a warmer and friendlier atmosphere for neighbourhood dining. WEC has been involved in the design of 12 new Browns Socialhouse locations in British Columbia, Alberta, and Saskatchewan. 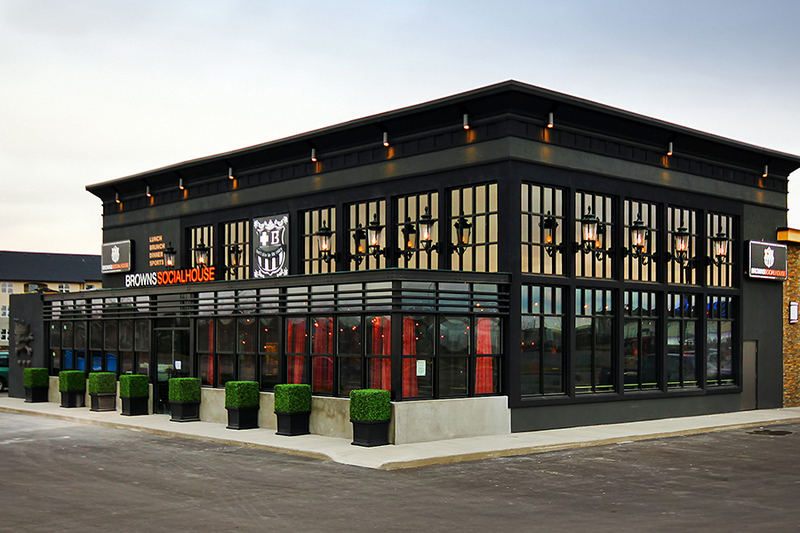 “Approaching the Brown’s Socialhouse projects involved creating a standardized design that could be replicated in multiple locations, while also ensuring a consistent look and experience for customers. By building on a uniform design, our team greatly minimized the redevelopment of specific design details and challenges, which in turn meant a quicker delivery time for the franchise owners.” – Stan Poznekoff, Senior Project Manager, Abbotsford. Every restaurant is slightly different, creating a unique dining experience that makes guests feel comfortable and relaxed just like at home—which inspired the name Socialhouse. To help find savings, Browns Restaurant Group prefers to choose an existing locations for new franchises. Our engineers need to be cognizant of the design challenges this can pose, for example, using existing equipment and laying out ducting in a way that is aesthetically pleasing and functional. “Designing around multiple existing buildings in several different locations posed some challenges to our design team. For our team to get around the various site challenges we ran into, we consistently went back to our standard design to find where modifications could be made to keep in line with the unique look and feel of the restaurant. Keeping to the restaurants unique branding was a goal we wanted to maintain from location to location—regardless of any site challenges—and something we ultimately achieved.” – Stan Poznekoff, Senior Project Manager, Abbotsford. We have worked closely with Browns, architects, and trade professionals to develop an equipment selection standard to help keep costs down and to facilitate budget, construction, and deadline restraints. “Our team quickly became attune to solving reoccurring site and construction issues that may have impacted the standard design as they went from project to project. This allowed our team to iterate and collaborate on several aspect s of the design moving forward that in the end saved on construction time and cost for the franchise and its owners.” – Stan Poznekoff, Senior Project Manager, Abbotsford.